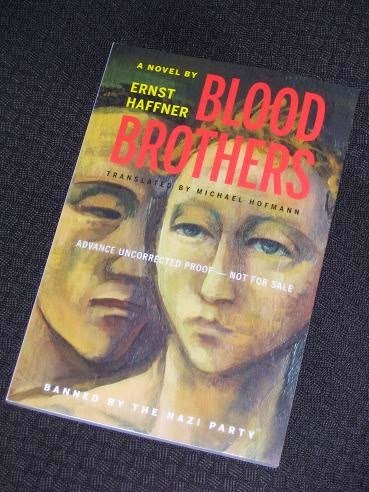 Ernst Haffner’s Blood Brothers (translated by Michael Hofmann, review copy courtesy of Other Press – released on the 3rd of March, 2015) begins with a group of young men in Berlin. They’re part of a generation growing up after the First World War without parents, and most of them have run away from state homes for orphans – being under the age of twenty-one, they are deemed unable to fend for themselves. Blood Brothers caused a minor sensation in Germany recently, and the story behind the book explains the interest. It was originally released in 1932 under the title Jugend auf der Landstraße Berlin (Youths on the Country Road to Berlin), and it was rereleased last year under the new title Blutsbrüder (Blood Brothers). Novels portraying life during the interwar period are always popular, and this one, showing life in Berlin immediately prior to the Nazi rise to power, was a big hit. There are dingy shops as fronts for illegal businesses, ‘warming halls’ where the homeless are permitted to spend a few precious hours out of the cold and, as described above, the boarding houses where, for a few pfennigs, the down and out can rest with a roof over their heads. And why are we going to have to wait to read it in English – was this a very early version of it that you read? Sounds like it was only recently rediscovered in Germany too – and a miracle, really, that it escaped the Nazi purges. What an intriguing back story as well – clearly, it was easy to 'disappear' in those years (voluntarily or not). Yes. I've added it to my wishlist as well. Stu – It's a much easier read than Döblin's book, but the setting and poverty is the same. Thanks for bringing this book to my attention. I have never heard of the author and missed somehow the reviews when it was re-published in Germany. Subject matter and style remind me a bit of Georg K. Glaser's book Schluckebier. Glaser's autobiography Geheimnis und Gewalt (Secret and Violence) simply blew me away and it is on my big TBR pile. That goes on the wish list. It sounds amazing. Like Thomas I had't heard of it and also missed anything in the news. I'll have to wait to get it. It's only available as a hardback for the time being. Thanks for this review. Thomas – That's surprising because a lot seems to have been made of its success in Germany on its rebirth (I hope that wasn't all publisher hype!). Thomas – It's not up there with the Döblin, but it is another look at a fascinating era. This sounds great and I've added it to my TBR list – I'll just have to make sure I remember it amongst the others. the subject matter seems to be one more usually covered by US authors, such as tales of hobos in the '30s or earlier. It'll be great to read a similar book from a German perspective. Jonathan – Yes, I wasn't sure about writing a review now, but I felt that I'd forget otherwise. This era is actually quite well covered in German-language literature, but it's always a time that's worth reading about.